Last year at KLEFF2017, we successfully organised a whole-week festival and it was an amazing experience. We engaged with so many new partners, initiatives and individuals and the great thing is that everybody is working towards the same goal. 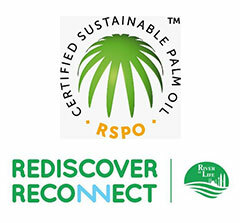 Moving forward, this year we started off with the launch of KLEFF2018 with the first round partnership with the Kuala Lumpur Malay Chamber of Commerce (KLMCC), River of Life, Roundtable for Sustainable Palm Oil (RSPO), Tanamera Tropical Spa, Publika and MAP KL. This partnership marks the new initiatives to bring KLEFF to a new level. We are working hard to get more partners to take this journey with us this year. 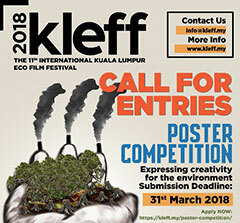 The KLEFF2018 has announced two new special awards for films with our new partners and one poster competition. We are looking for new ideas from the public especially the youths to tell their stories and ideas about our environment. This means we are now opening our invitation to universities in Malaysia and Asean to become our University Partners to enjoy special film screenings and ilm making workshops at your university. Lastly, on behalf of KLEFF Team, I would like to wish everyone Happy Chinese New Year! 2018 is going to be a massive year, and we look forward to work with you again. 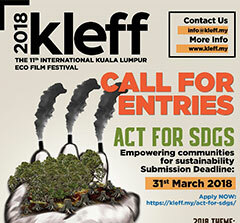 On 29th January, the 11th International Kuala Lumpur Eco Film Festival (KLEFF) was launched at the Colab: Tourism @ Kuala Lumpur Travel Mart 2018. The launch announces the festival’s 2018 theme: “Forest, Water and Climate Change”, as well as its partnerships with the Roundtable on Sustainable Palm Oil (RSPO), River of Life (ROL), Publika Shopping Gallery, Tanamera Tropical Spa Products and Kuala Lumpur Malay Chamber of Commerce (KLMCC). More information can be obtained from the post event release here. 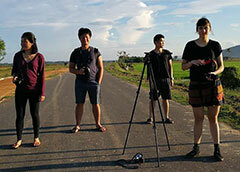 KLEFF on News – Malaysian Digest: Calling All Filmmakers, Kuala Lumpur Eco Film Festival Is Back And Seeking Submissions! 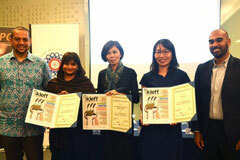 Check out Malaysian Digest’s article featuring KLEFF and the interview with one of KLEFF past winners! 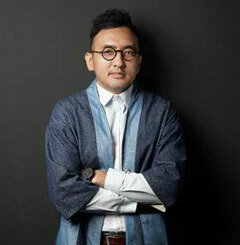 If you are curious about the mastermind behind KLEFF, you wouldn’t want to miss this interview with the KLEFF Festival Director himself, Fadly Bakhtiar.